Sometimes we are told that committed and "Christian" scholarship must be partial and biased because, well, to paraphrase Ms Mandy Rice Davies, we would say that, wouldn't we. Some years ago, in her inaugural lecture as a Professor in this University, Sarah Foot put this notion down. She was not keen on the idea that, in order to be 'academic', the 'profession' in a modern university of a subject like ecclesiastical history has to be left to those who have a reductionist view, and who see the subject from a hostile and secularising standpoint in which Faith simply has to be considered a facade for more mundane and untheological historical processes. It is the duty of the ecclesiastical historian to restore 'their present' to earlier communities by taking them seriously. While the student does not have to be a believer, (s)he should have an empathetic (my word) understanding of the faithed humans (s)he describes. What is the proper answer to an argument proving the existence of the Landlord [God]? You say that because you are a Steward [priest]. Good boy ... what is the answer to an argument that two and two make four? Professor Jonathan Riley-Smith of the Daughter University spent some decades restoring a genuine theological conviction to the Crusaders. And I remember particularly the words of M Schneiders in 1996, discussing early Irish liturgy: for a proper understanding of the past an affinity with the material is useful, at least if one wishes to go beyond the recovery of mere facts, if one tries to understand the people who used these texts, who celebrated Mass with these ancient prayers. But 'useful' is too timorous a word; and Dom Gregory 'Patrimony' Dix put it so much more memorably ... well, he would, wouldn't he? ... when, writing about the Canon Romanus, he said: This very morning I 'did this' with a set of texts which has not changed by more than a few syllables since Augustine used those very words at Canterbury on the Third Sunday of Easter in the summer after he landed. Yet 'this' can still take hold of a man's life and work with it. I (vermiculus et pulex) fully agree. Allow me a little linguistic analogy: Latin , as a living language, can only be taught by the Church and properly learned only in the Church. Everyone else (the "classics" establishment which has successfully declared itself to be the worldwide authority on the language of the Romans) teaches it as something external, always as an "object" of study that can only be fully grasped by those who analyze and translate it. Only in the Church is Latin approached as "our" language, not to be explained, not to be mimicked, but to be used with the same freedom with which we use our vernacular. When classicists try to write in Latin (never mind speak) they immediately betray, even when using proper Latin words and flawless grammar, a serious lack of familiarity in style. 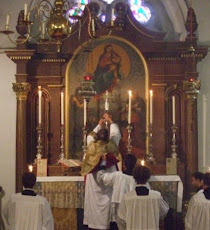 For those who use the well-known Feedly.com service for following this blog's posts, I've noticed a lot of posts are not being shown on Feedly, for instance, the whole "Consecration in the Roman Mass" series. I've opened a support ticket there and hope they fix it soon. In the meantime, it's best to visit the blog regularly. And, Fr., thanks for the excellent blog and pardon me for any writing slips (Portuguese is my main language).